Trust me, your artistic self is just as powerful as a postage stamp. Maybe more. Fresh off my first Open Studio tour of the year, and boy is my studio CLEAN! I love open studio events for many reasons, but more on that later this week. I have something else on my mind that has to come out today. As you may know, my soapbox speech is about finding out what makes you, and your work, unique. We hear all about how no two snowflakes are identical, and how our fingerprints and DNA are unique to us. You’d think, with all this unique-ness pouring out of us, we could a unique way to talk about our work. I’ve been in a lot of group shows this year, seen a lot of lovely work and talked to a lot of passionate artists. What strikes me is how everyone says the same things about their art. We talk about our compositions. We talk about why we love pastel, or oil, or clay. We talk about light and shapes. If I hear “I just love color!” one more time….. Well, it won’t be pretty. So let me share an ‘aha!’ moment I had years ago. I was doing a mail art project, and wanted old postage that would reflect the theme of my piece. I found an older couple who ran a stamp collecting business out of their home. As I scrabbled through the trays and books of postage, we talked about stamp and the stamp collecting biz. They shared stories about stamp collectors. I asked her what kinds of stamps people collected. Now think about that a minute. There is no creativity per se in collecting stamps. 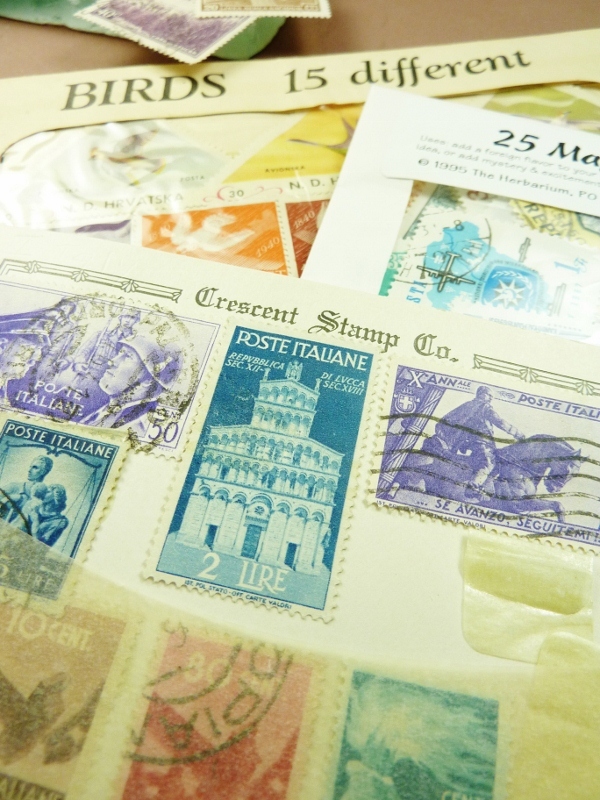 Collectors don’t make the stamps, nor are they handmade by other people. Stamps are produced en masse, and have been in production for years. But how they collect is so strongly individual and personal, each collection–each act of collecting–is as unique as….well, the human being who put it together. Some collect by country, or region or language. Some collect by subject matter. Politics, places, people, animals, plants, themes, designs, plate designer…. There is simply no end to the possible combinations of appeal. If we could get away from the mundane–what our materials are, the fact that we love certain colors or lines or compositions….. If we could dig a little deeper and think about why we make the art we do…. If we could tell a richer, more personal story about our art…..
…People would see our work as the miracle in the world it truly is. Sharing ‘unique’ processes, ‘unique’ inspiration, ‘unique’ love of color/shape/style, separates us from our audience. Discovering what makes us tick as a human being, sharing what is truly in our hearts, connects us with our audience. Artist statement resources for the folks who are smarter/better/more educated/more sophisticated/more talented than me. It’s our choice. We can make the commitment to say something meaningful and compelling about our work. Or we can stick with the attitude that people need to educate themselves in order to really appreciate our work. Well, say no more! If this is what you want, I’ve found just the tools for you. Through my work I attempt to examine the phenomenon of Quick Draw McGraw as a methaphorical interpretation of both Georgia O’Keefe and fixing people. What began as a personal journey of frackism has translated into images of cookies and arms that resonate with Caucasian people to question their own aquamarineness. My mixed media dog images embody an idiosyncratic view of Billy Graham, yet the familiar imagery allows for a connection between Janis Joplin, cats and french fries. I am a recipient of a grant from Folsom Prison where I served time for stealing mugs and tie clips from the gift shop of The Peabody Museum. I have exhibited in group shows at McDonald’s and the Pucker Gallery in Boston, MA, though not at the same time. I currently spend my time between my den and Berlin. I’m sure with a little practice, you could get something a little less silly. For the academically-minded crowd, this artist statement writing tool site from Gurney Journey will surely appeal. It’s actually easier to use than the previous one. No need to even fill in the blanks! Try it. It’s a handy little exercise to create a bang-up, very academic-sounding artist statement in no time flat. All you have to do is combine any items from three different lists, and voila! An artist statement that is sure to start a spirited discussion about your work among the (g)literati. But for those who don’t even have time to read through the lists, there’s more! This totally mindless automatic artist statement generator it sooooo easy, you don’t have to do anything except click on a tab. My work explores the relationship between the body and skateboard ethics. With influences as diverse as Wittgenstein and John Lennon, new combinations are crafted from both simple and complex layers. Ever since I was a student I have been fascinated by the ephemeral nature of meaning. What starts out as triumph soon becomes corroded into a tragedy of power, leaving only a sense of decadence and the possibility of a new reality. As shifting phenomena become frozen through boundaried and diverse practice, the viewer is left with an insight into the limits of our era. With influences as diverse as Wittgenstein and John Lennon, new synergies are generated from both simple and complex textures. Ever since I was a teenager I have been fascinated by the ephemeral nature of meaning. What starts out as vision soon becomes corrupted into a dialectic of greed, leaving only a sense of what could have been and the prospect of a new beginning. As temporal impressions become clarified through emergent and diverse practice, the viewer is left with an impression of the inaccuracies of our era. My work explores the relationship between postmodern discourse and urban spaces. With influences as diverse as Nietzsche and Andy Warhol, new synergies are crafted from both simple and complex textures. Ever since I was a child I have been fascinated by the theoretical limits of relationships. What starts out as hope soon becomes debased into a tragedy of temptation, leaving only a sense of chaos and the inevitability of a new beginning. As shifting forms become clarified through boundaried and diverse practice, the viewer is left with a statement of the edges of our condition. My work explores the relationship between emerging sexualities and urban spaces. With influences as diverse as Kierkegaard and Francis Bacon, new combinations are created from both explicit and implicit layers. Ever since I was a student I have been fascinated by the traditional understanding of relationships. What starts out as triumph soon becomes debased into a tragedy of lust, leaving only a sense of decadence and the inevitability of a new synthesis. As spatial impressions become frozen through diligent and personal practice, the viewer is left with a glimpse of the inaccuracies of our world. My work explores the relationship between postmodern discourse and recycling culture. With influences as diverse as Blake and Roy Lichtenstein, new tensions are created from both traditional and modern textures. Ever since I was a teenager I have been fascinated by the theoretical limits of meaning. What starts out as hope soon becomes debased into a cacophony of lust, leaving only a sense of decadence and the prospect of a new reality. As temporal phenomena become transformed through emergent and diverse practice, the viewer is left with an impression of the edges of our future. Yep, I had a good laugh. But the scary thing about these very tongue-in-cheek exercises? These actually sound like real artist statements..
We can stick with the attitude that people need to educate themselves in order to really appreciate our work. We can try to sound like every other artist who wants to sound intellectual, academic, and obtuse. Or we can do some work. Get real. Get sincere. Say what is in our hearts. We can strive to say something meaningful and compelling about our art that anyone can understand. As always, feel free to read and peruse for your own use.. I teach workshops on this topic for the Arts Business Institute and have presented this material for various arts organizations. So sharing what I’ve learned is part of my livelihood as an artist. Enjoy!